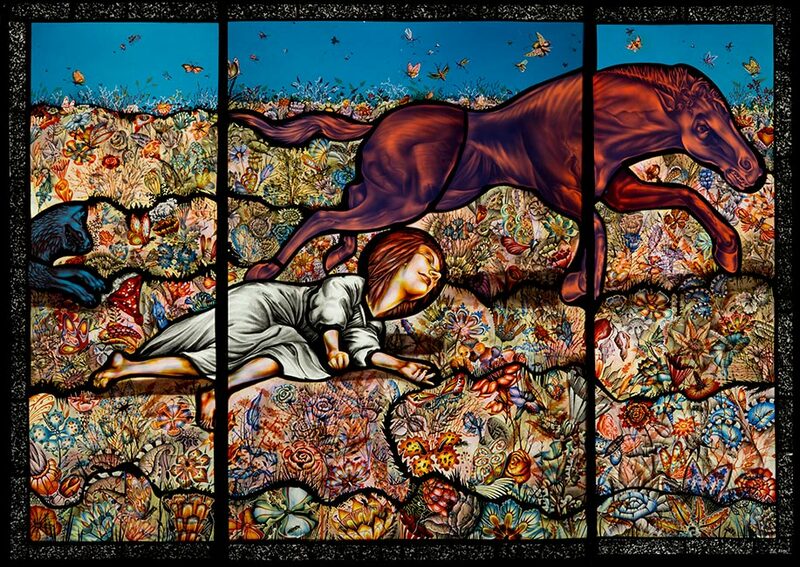 Judith Schaechter is nothing short of a pioneer in contemporary stained glass fine art. She is continually breaking down preconceptions about the nature of the medium, both through her technique and her subject matter. 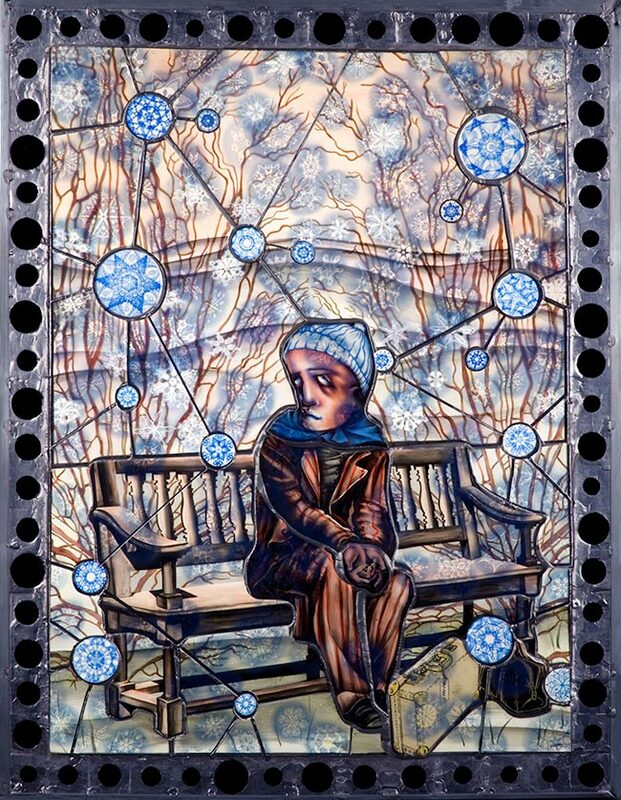 Schaechter remains modest about her techniques, stating that they are fairly traditional, however, what sets her work apart is how they combine in such an innovative manner to create her profound images of unique beauty. 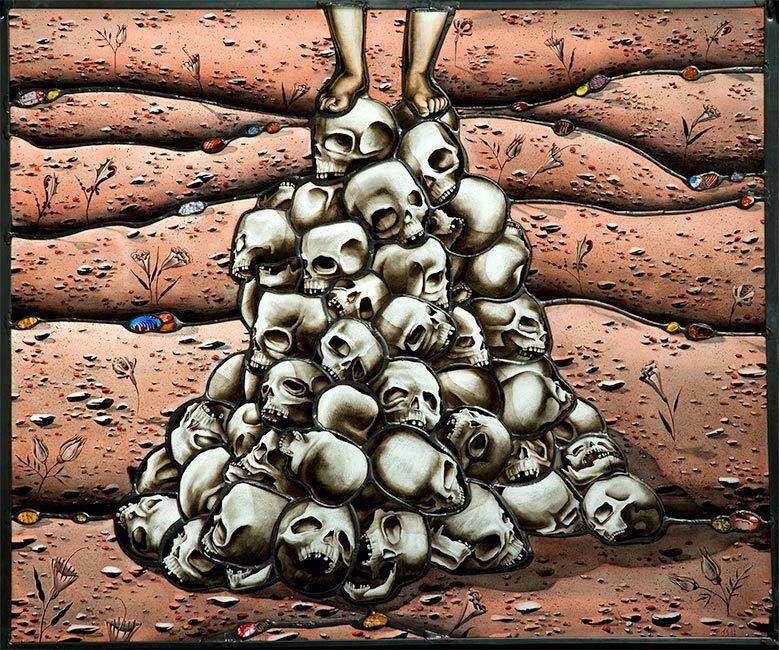 Judith’s improvised narratives convey tales of human failings and are rendered with painstaking detail. 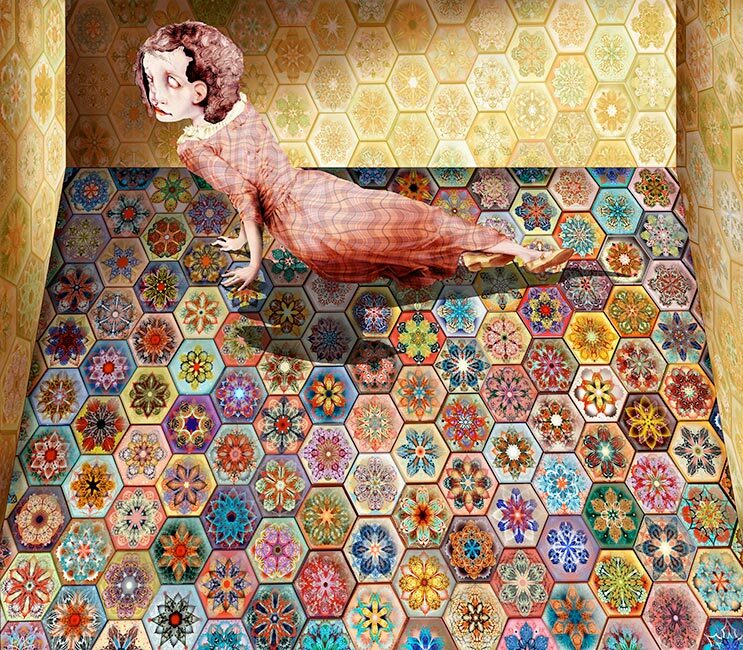 They unfold in a cornucopia of texture and colour, which imbue her protagonist’s shortcomings with an air of palpable optimism. 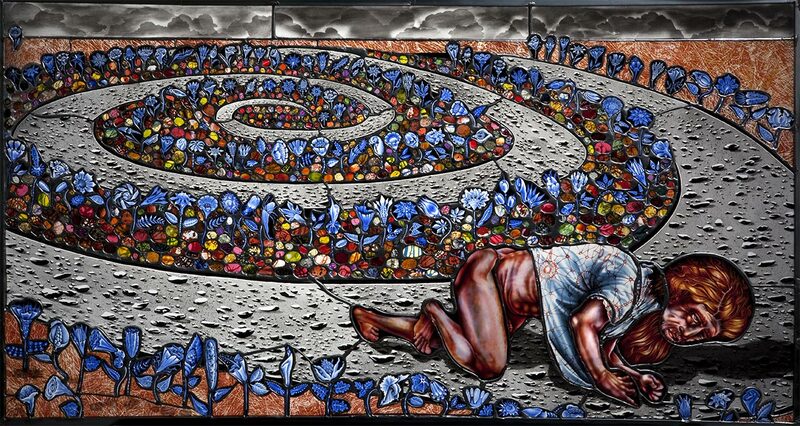 While remaining figurative, her visual aesthetic is distinctly contemporary and often has more in common with the stylizations associated with underground comics, than the medieval scenes which may come to mind when the subject of stained glass in mentioned. 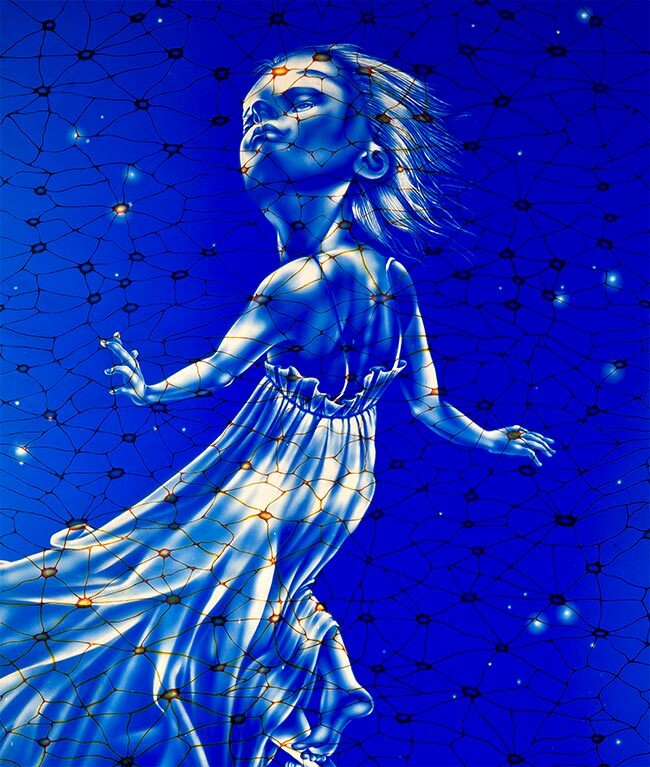 Judith was born in Gainesville, Florida in 1961, and grew up in Massachusetts. 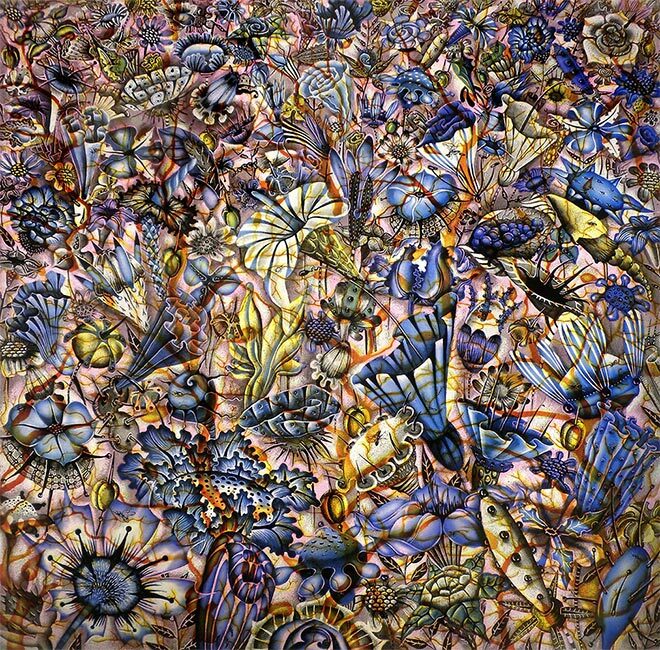 She graduated from Rhode Island School of Design in 1983, with a BFA in Glass. 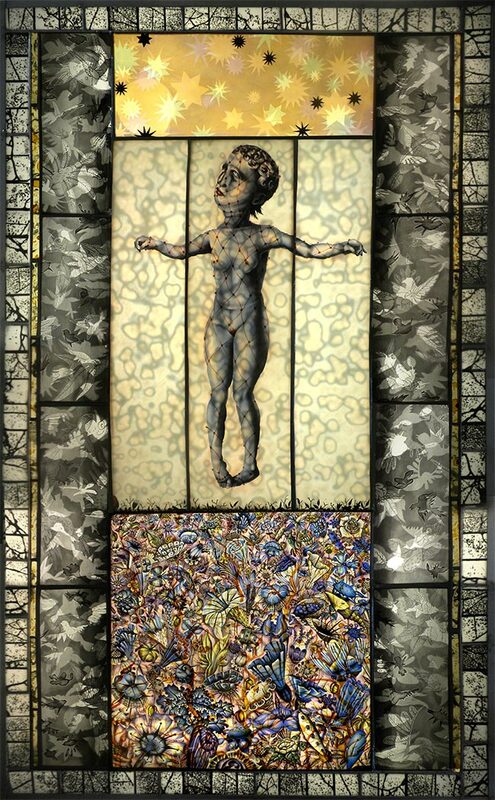 Her fresh approach and significant contributions to the field of stained glass have won her many awards and seen her solo exhibitions displayed in numerous museums. Judith is also very forthcoming with regards to sharing her knowledge and regularly teaches classes all over the world. 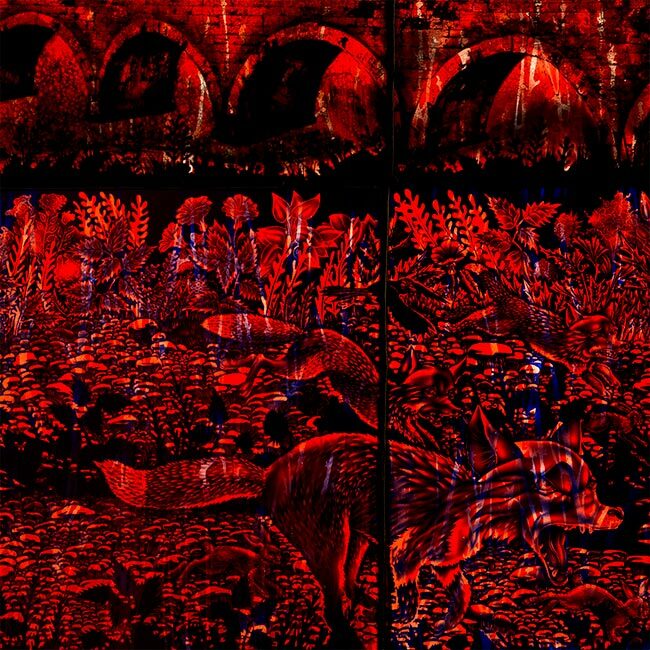 WOW x WOW jumped at a recent opportunity to ask Judith some questions about her working practice, creative contemplations and thoughts about the future of stained glass. Read on! Hi Judith, thanks ever so much for making the time to join us for a chat, we really appreciate it. 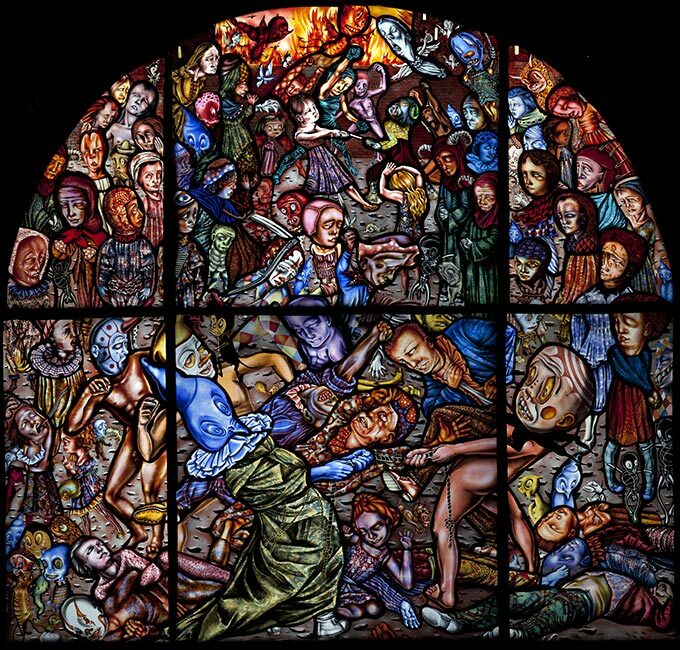 If you could please start us off by introducing yourself, touching on anything you feel relevant to story of Judith Schaechter the artist? Hi, I’m Judith! I am too self-conscious to think of anything else to say except that I make stained glass windows and have been doing it for over 30 years now. It’s in my house, which is old and Victorian. The upstairs studio is not very big—maybe 800 sq. ft., but I also use a lot of the basement—that’s where my storage is and my sandblaster which is a large machine that generates a lot of dust. My upstairs studio is very neat and organized. I have ADD and I’m really easily distracted so there’s not much in there to over-stimulate me! Nothing on the walls at all. Also, because I have four cats and I don’t want them to get glass in their paws so I try to keep it clean. It couldn’t be more boring, but it is pleasant and sunny! How important is the mystery of the creative process to the way you work? Do you feel that if you over analyse an idea before you start working on a piece you’ll lose interest? I think being precious about some type of mystery is ridiculous. If it is so flimsy that it will melt away under the bright lights of examination then it must be pretty superficial in the first place. That said, why analyze? There is nothing to be gained. Believe me, I have tried. In fact, and this may sound strange, but I don’t think I have ideas, so there’s nothing to analyze anyway. I am guided by drawing and by process and materials and a synthesis of influences and experiences and random thoughts, not ‘concepts’, whatever they are. I am not trying to be deliberately difficult, but I find it hard to isolate the location or incident of ‘creative process’ or ‘an idea’. I have no sense of a consolidated event. It’s all a big mush and it is integrated with my life and with teaching, etc. I mean, I know when I am in the studio doing procedural stuff like cutting and grinding glass. But when is the ‘creation’ part, what is the ‘inspiration’ part? Usually when I work I am listening to the radio and thinking about whatever they are talking about, so I am not even thinking about the piece. I tend to lose interest if, during the process, the piece is delivering diminishing returns, I get testy if everything isn’t a major breakthrough—but this isn’t always a fault of the piece. Also, I don’t like it if it doesn’t look good the entire time, which means I tend to reject them during their awkward teenage phases. I try to strike a balance between just throwing them out and starting again versus endless resuscitation attempts. One way to navigate both the ‘mystery of the creative process’ and the tendency towards dictatorial stifling perfectionism (which is about the most unmysterious thing in the world!) is to separate myself from the work. I try to think of them as autonomous beings, not extensions of myself and not subject to my egotistical desires. This usually means that they surprise me in a good way more often! 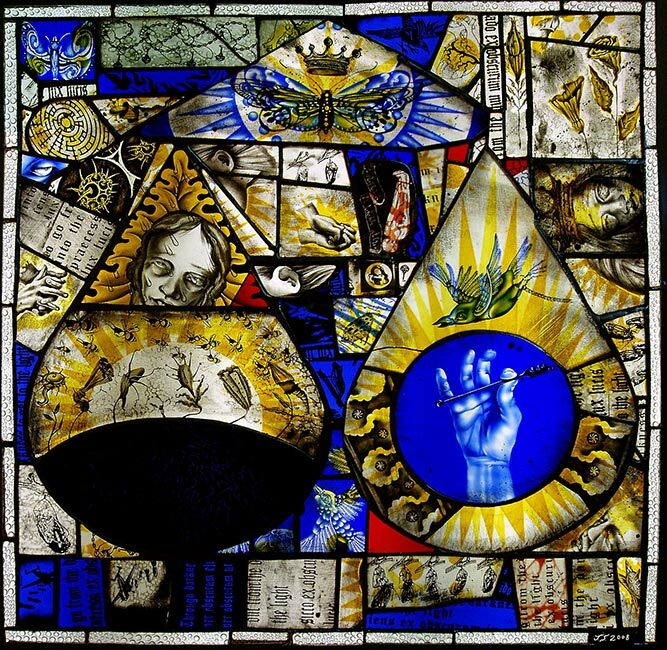 When creating your work, to what extent do you like to think about the time honoured historical traditions of the stained glass medium, be it in subject matter or technique? I can say definitely that I never used to think about history at all, but that’s changed in the past few years. But maybe not as a huge influence on the work—maybe a little. I mean, it comes directly from that tradition. But, when making work, I pretty much am in the private world of that piece alone. I am not sure I think about anything other than if it is looking OK, on its own terms. I love the history of medieval glass. But I don’t feel one must be tied to it in such a way that you can’t be creative and innovative. A lot of stained glass practitioners are really doctrinaire fascists about this; it has to be done the old way to be ‘right’. Some will graciously allow experimentation but only if the artist has paid their dues and learned the traditional way. I beg to differ….But I would like to think I honor those traditions regardless. As to the subject matter, I think I very much fit into that tradition as well, although I am not religious. 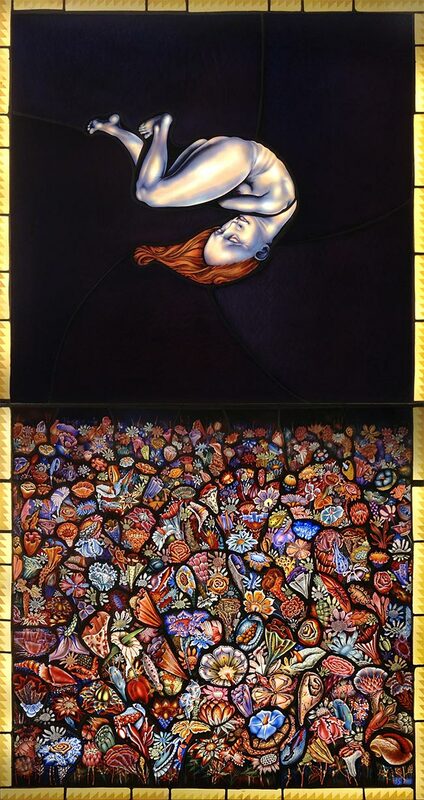 To me, they (my pieces) are images of people transcending their own pain, which I think is the point of much art, religious and otherwise, stained glass and otherwise. There is a distinct timelessness quality to your work. How do you approach this aspect of your image making? Timelessness is really important to me as I hope the work will resonate with people in the future…and if they invent time travel, then also with people of the past! That’s the gold standard, right? Being relevant to as many humans as possible? Anyway, I am very cautious about deliberate signifiers, like brand names, and obvious current things like 2016 model automobiles, or whatever. I think the thing that will date my work most is clothing, but I try to make it pretty generic. It’s too funny to look at Renaissance nativities and imagine that Joseph and Mary dressed like 16th century Dutch people! But at the time, it was probably kind of invisible to the audience when the work was made. Is glass a particularly unforgiving medium to work with? Well, I am carving into it and carving anything, well…if you carve too much, it ain’t coming back. Its not for the highly nervous or risk averse. Glass can be unforgiving in that it’s so lovely at the outset; most of what you do to alter it will make it uglier. So the addition of the artist’s voice tends to wreck it. Transmitted light, glowing light, as I have said elsewhere, promises transcendence and when it doesn’t deliver it is very disappointing. For this reason the stakes are quite high with glass. Stained glass artists very often have assistants who they delegate certain tasks to. From what you’ve said in previous interview it appears that you choose not to employ any. Can you talk us through your choice? Well, I have worked with interns and assistants on rare occasions. This may sound really arrogant, but they are not skilled enough and I have to spend time creating projects they are capable of, and that’s not how I want to skew my projects! Furthermore, I spend a lot more time cleaning up their messes. I was always redoing their work the days they weren’t there. It’s just faster to do it myself. Second: my studio is too small to accommodate two workers comfortably. Also, and this is very important, I have no set plans for my pieces. I have to make them myself to know where they are going. And they change a lot on the way. So, if someone else were doing it, they would look very, very different when they were done. They would look as I had planned them and that’s no good. What you see in my work is not what I planned but what they needed to become. You have written extensively about ‘beauty’ with regards to the aesthetics of man made artefacts. What thoughts about beauty float around your head when you’re setting about a days work in the studio? 1. This will be the most beautiful thing anyone has ever made ever! 2. This will be the most beautiful thing I have ever made. 3. This will be the most horrendous abomination on the earth if I don’t get lucky. 5. Wow, it’s starting to look rather interesting! 6. Where did that come from?? 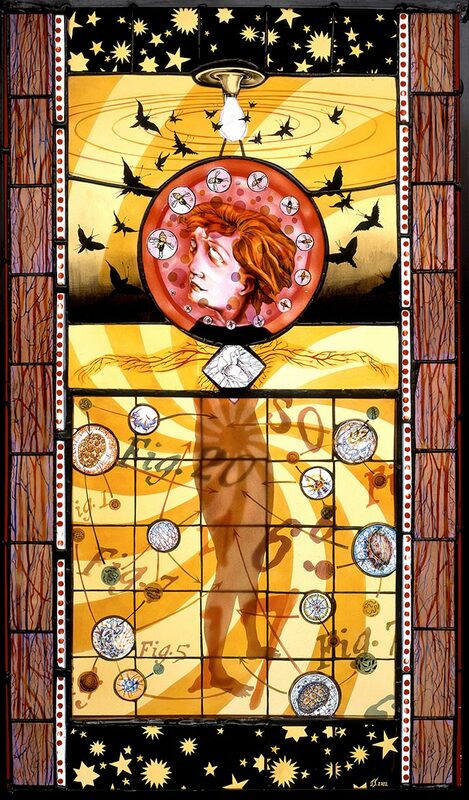 As a pioneer within the world of stained glass artists, you are the source of inspiration for many up and coming artists working with the medium within the realms of fine art. 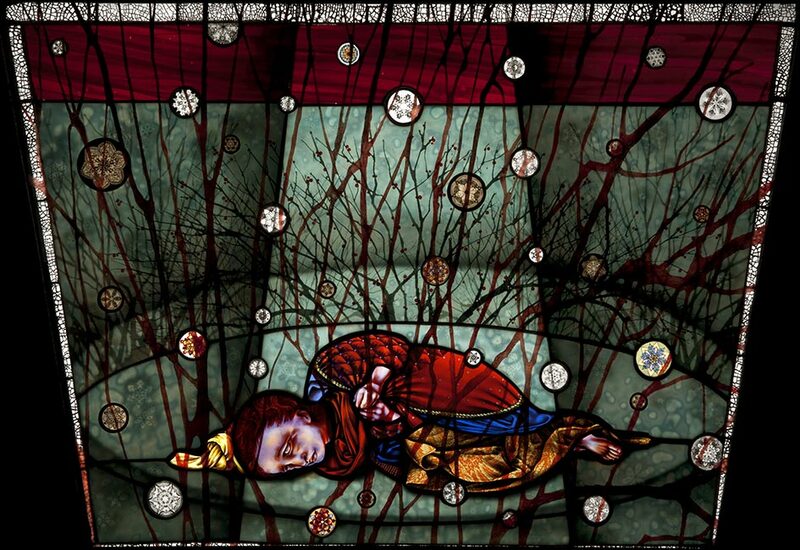 However, you have on certain occasions voiced your opinions about stained glass being a dead art form. How tongue in cheek are these comments? 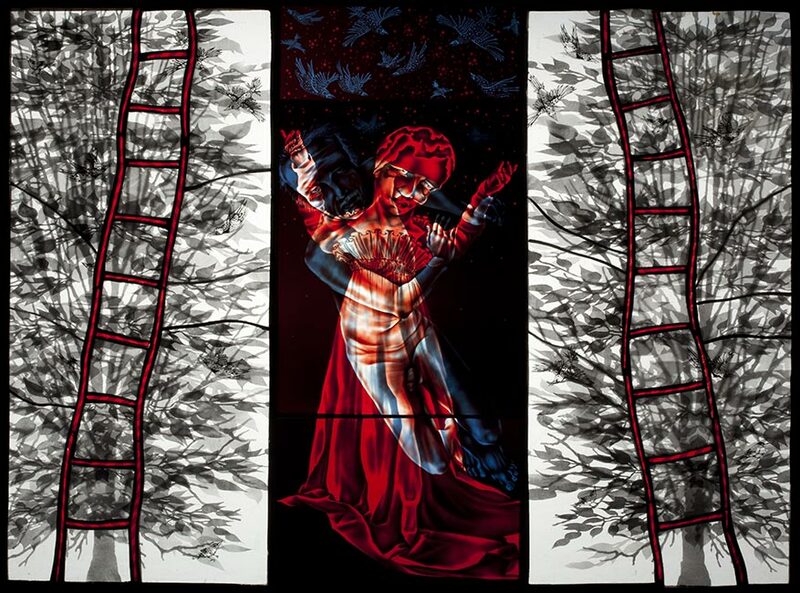 What do believe to be the future of stained glass artistry? 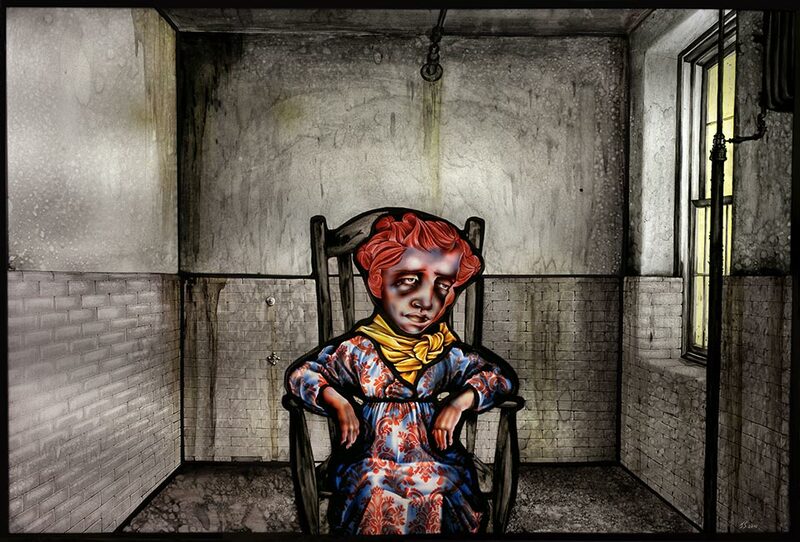 Or to rephrase that, what are your hopes for the next generation of stained glass artists? Oh, it’s not tongue in cheek at all!! Stained glass is dead!! Deader than dead. Long live stained glass! That last time it showed signs of life was post WWII reconstruction in Europe and it was apparently merely an isolated death throe. 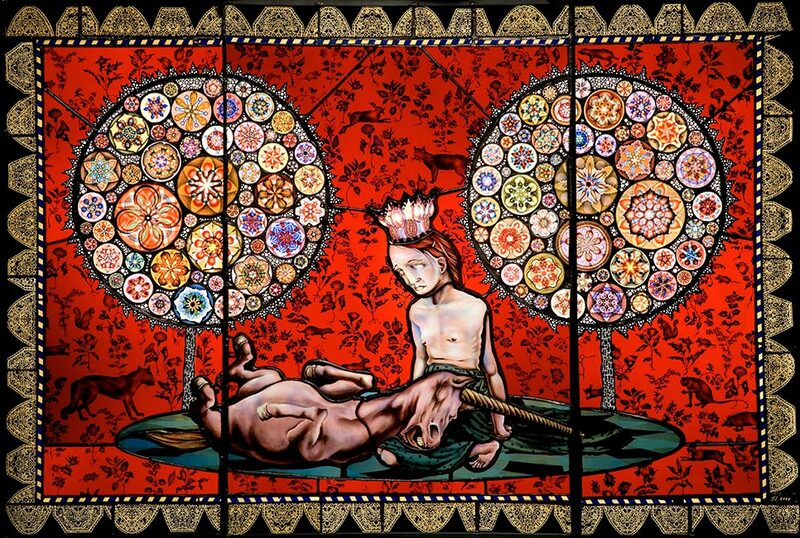 What will be the future of stained glass artistry? Frankly, I think it’s really, really bleak. 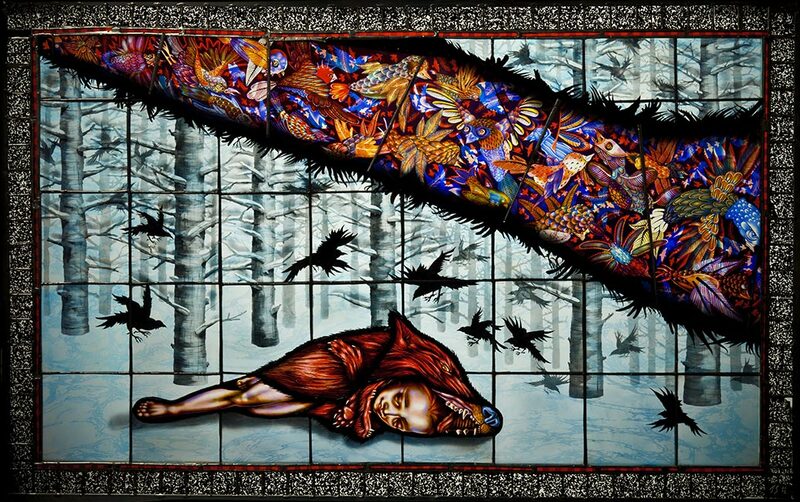 What are my hopes for the next generation of stained glass artists? What next generation? I don’t know of anyone. Seriously. I have been teaching for 20 years and none of my students have made a career of it. I mean, I know there are people out there, but I don’t think it’s very many. The art form suffers from being sequestered from the art world. It’s not taught in art schools very much, for better and for worse. Many of the artisans carrying out the traditions are not very creative, and they certainly are not innovative. It has no glamor next to web art, 3D modeling and printing and other recent technological breakthroughs. But glass will always look beautiful with light streaming through it. So, some of the use, recently, of colored glass in architecture has been very refreshing. Maybe that can sustain it for a while longer. 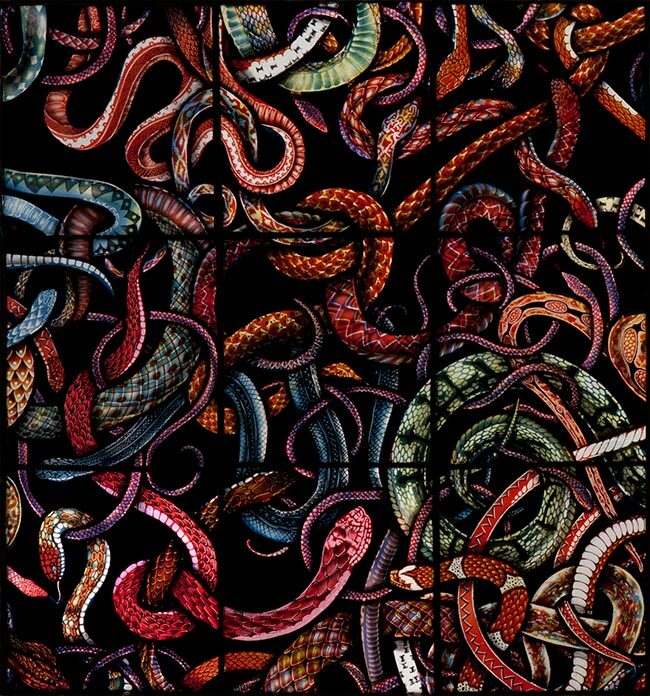 As you mentioned, you have been working with stained glass for over thirty years. Somewhere within that time you began to use electronic technology (i.e. a computer and Photoshop) as a component of your process. How has the addition of this tool impacted on the creative methods you employ? I used to Xerox all my sketches. I would do it at a variety of enlargements and I would flip them as well. My monthly Xerox bill was crazy! So, in 2000 I got a computer. Now I work in Photoshop and it’s had a huge impact in that I can test out literally thousands of combinations of doodles and sketches and cross-pollinate images etc. My feeling is that it doesn’t simplify or make anything easier—it’s just a new way to be complicated! It brings its own set of crazy parameters into things—I mean who needs to see 1000 variations on an idea? It’s overwhelming. But that’s how I tend to use it. Before I could only road test about 50-100 combinations. But do I think this represents an improvement? I don’t think so; it’s a lateral move. Its just different. I was really into making negatives for photo stencils too, but the printers I have used, all three major brands, are JUNK. Junk!! I always end up fantasizing about stomping them to pieces and I am not ordinarily a violent, angry person. So, this channeled me back into the hand made, ironically! Having taught your innovative techniques to stained glass artists all over the world, what is the one thing that you would like them to remember you for? I hope they remember me as a good, caring and inspiring teacher! When I was a kid I used to sit extra long on the toilet because the linoleum on our bathroom floor (which, I guess was intended to resemble marble) looked like stormy seascapes. They were of breathtaking beauty to me, Turner, eat your heart out! Is there anything you know now that you wish you had known when you were starting down the path of being a professional artist? No! I teach a professional practices class and the students all dream that there’s some way to pre-manage for every contingent possibility and that maybe there really IS a recipe for success and all I can say is that I am glad I was naïve! I’m glad I didn’t take my own class! I am glad I was totally unprepared! It was tremendous protection against reality! If I had known what I was up against, I would have been too intimidated to even try. 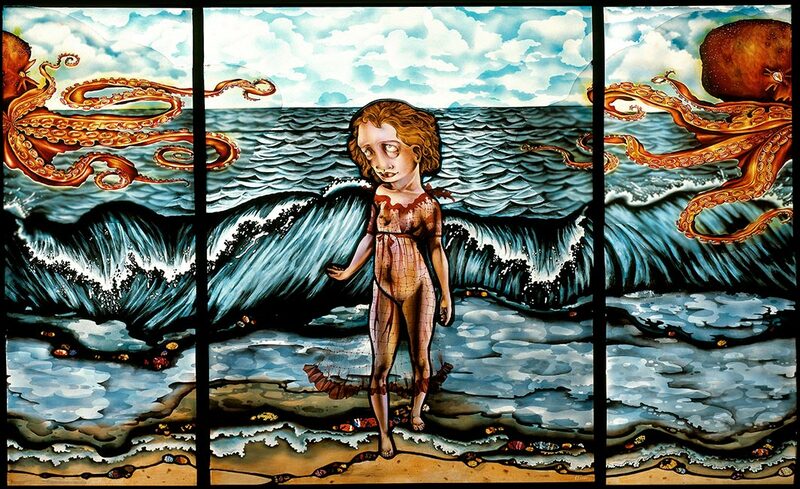 What’s next for Judith Schaechter? I never know!! Keep on keeping on! !